Wow. I did not realize how much time it takes to get settled in after moving (or maybe I’m just getting old 😉 )! But just wanted to share a few snapshots from moving and settling in over the past week. 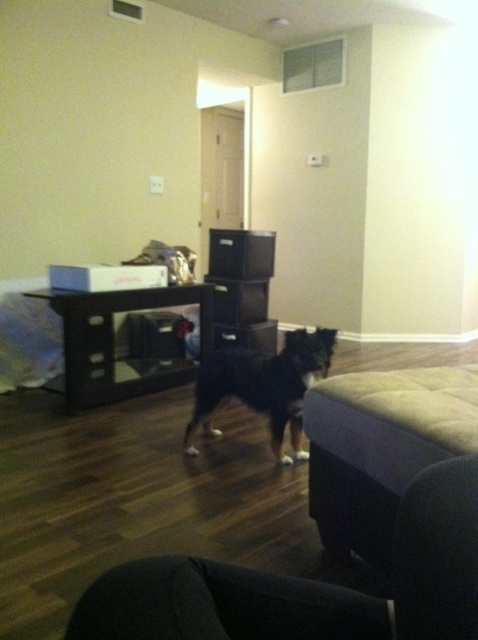 The mess at first… at least Emma seemed to be enjoying the new place and not bothered by the wood laminate floors! She’s doing great now. We have a ton more kitchen cupboard space, which I’m thrilled about. 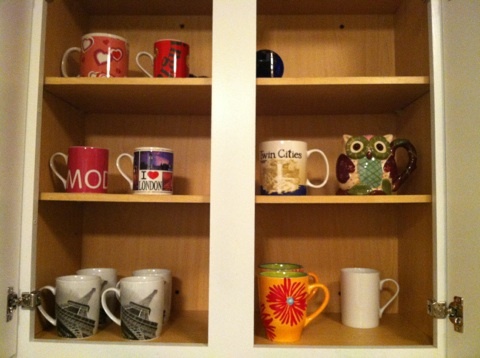 We don’t even have a lot of kitchen supplies, but our cupboards were always so crowded at the old place. 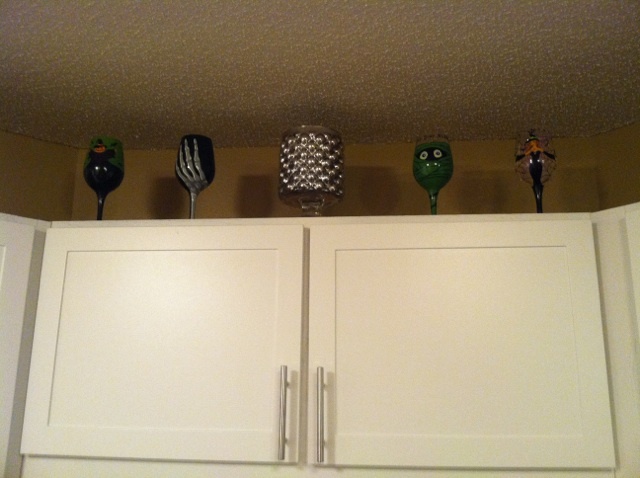 With the move I haven’t been able to get out all of my Halloween decorations, but at least I got these Halloween wine glasses out! And finally…. BATHROOM COUNTER SPACE = AMAZING. I can actually have all of my hair/makeup out while getting ready! Decor is a work in progress. 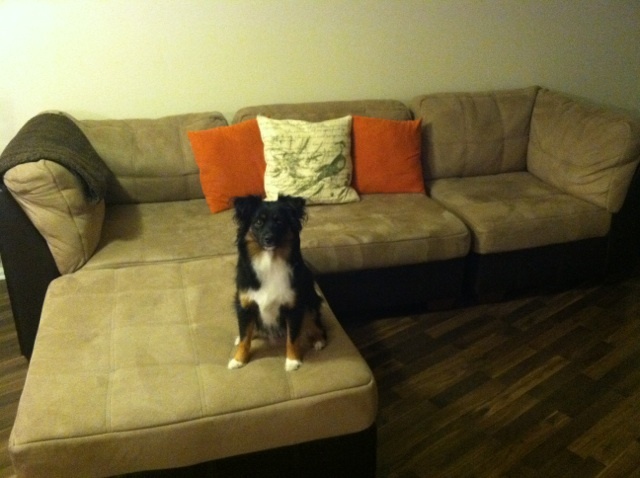 We are experimenting with the set up of our living room because of how open the space is! Now that we are getting pretty settled in from the move, I am getting SUPER EXCITED for my sister’s wedding this weekend! Holy cow, it feels like yesterday she was just telling me about a boy she met on the first day at her job right out of college. Who knew he would be the love of her life 🙂 Can’t wait to share more this weekend! Thanks Cara! I know I’m worried about that… I am definitely a person who likes to fill space 😉 My boyfriend is not too impressed with it, but hey I gotta be good at something! Oh I love all the counter space in the bathroom, score! Love the new place and that bathroom counter is a dream. Mine is teeny tiny. Yeah, I’m pretty excited about that. My counter used to be right next to the toilet. I don’t even want to say how many times I knocked something in it! Good luck unpacking! I love new spaces! I kinda have the itch to move as well…We shall see! Looove all the counter space in your bathroom! Wish mine had that! YAY! Moving is such a pain, but I actually really love organizing and finding places for everything! Moving into a new place is always so exciting and fun. It’s like a fresh start. Can’t wait to see the pics from your sister’s wedding this weekend! I hope the settling in continues to go well for you. I love all of your counter space in your bathroom. It is something I am seriously lacking at my house. Love the bathroom counter space and how cute is Emma? Oh gosh moving is the worst. We moved a year ago, and there are still things I haven’t done. Your pup is adorable. Hope you get settled quickly! I love your collection of glasses. Ah–your place looks adorable…AND THAT BATHROOM! I’m jealous of all your counter space. Hope you have a great time at the wedding this weekend! omg that counter space is a dream! and i love your halloween wine glasses, so cute! Moving is such a pain but once it's all set and organized, it feels amazing to have a new home. Enjoy and good luck finishing with the unpacking. Your new space is lovely- and Emma is a doll, as usual. 🙂 I can’t wait to see how you decorate the place! wow, looking good! moving is so awful, i just cannot stand it! and yay for your sisters wedding! The move wasn't too fun, but it went faster than I thought it would! But now I have so many bruises on my arms from carrying boxes lol. And thank you! Thank you Martha! 🙂 Definitely can be a pain, but totally worth it! I am excited to settle into a new home 🙂 Always exciting! it looks so nice!!! 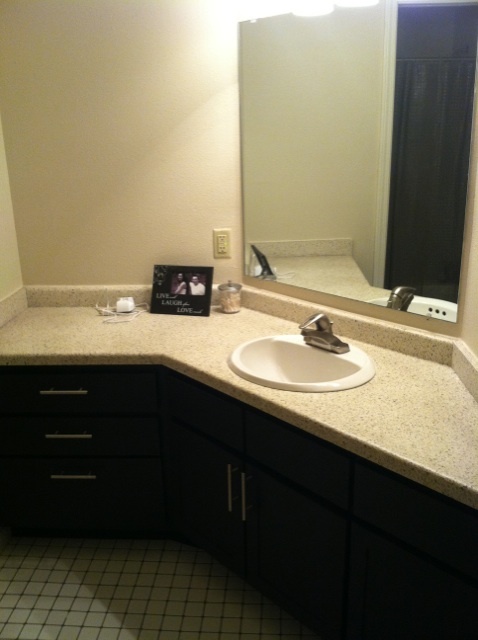 i love that bathroom counter space…jeaous! This place is so cozy and adorable! Your bathroom counter space is really amazing! I wish you all the best! How exciting! I can’t wait to see photos of the finished spaces, and wow that counter space is Ah-mazing! Oh unpacking…it’s almost as fun as packing! It took me forever to finally unpack all our boxes after we moved into our apartment. I think it’s one of the reasons I simply don’t want to move again lol. 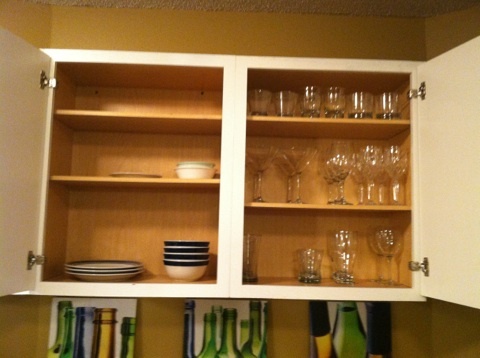 Your new place looks amazing – love that counter space! I can’t wait to see how you decorate it! Love the bathroom counter space! Congratulations girl! Your new place looks great! Very lovely post sweetie! Thank u for the nice words 🙂 Always a pleasure to have u on my blog!